DN : 65 ~ 100 mm. 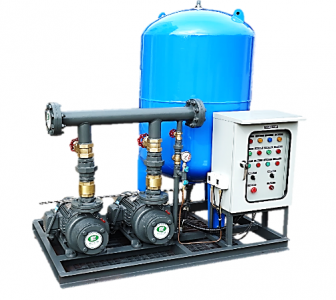 Features: Fully automatic control package booster pump unit equipped with two coaxial centrifugal pumps,fully electronic control in alternate and parallel operation to ensure the required supply pressure and flow rate. Selectable pump model and tank for various application. All componants are installed on common base channel steel. Application: Use for water supply to hospital, office building, hotel, department store and all industry use. *Custom specification are available upon request.